लास एंजेल्स की स्थालाकृति काफी विषम है, इसका कुल क्षेत्रफल लगभग ४९८.३ वर्गमील (१,२९०.६ किमी²), जिसमे ४६९.१ वर्गमील (१,२१४.९ किमी²) स्थल एवं २९.२ वर्गमील (७५.७ किमी²) जलीय हिस्सा है। इस लिहाज से क्षेत्रफल के अनुसार यह संयुक्त राज्य अमरीका का चौदहवां सबसे बडा शहर है। The city extends for 44 miles (71 km) longitudinally and for 29 miles (47 km) latitudinally. The perimeter of the city is 342 miles (550 km). It is the only major city in the United States bisected by a mountain range. The highest point in Los Angeles is Mount Lukens, also called Sister Elsie Peak. Located at the far reaches of the northeastern San Fernando Valley, it reaches a height of 5,080 ft (1,548 m). The major river is the Los Angeles River, which begins in the Canoga Park district of the city and is largely seasonal. The river is lined in concrete for almost its entire length as it flows through the city into nearby Vernon on its way to the Pacific Ocean. Los Angeles is subject to earthquakes due to its location in the Pacific Ring of Fire. The geologic instability produces numerous fault lines both above and below ground, which altogether cause approximately 10,000 earthquakes every year. One of the major fault lines is the San Andreas Fault. Located at the boundary between the Pacific Plate and the North American Plate, it is predicted to be the source of Southern California's next big earthquake. Major earthquakes to have hit the Los Angeles area include the 1994 Northridge earthquake, the 1987 Whittier Narrows earthquake, the 1971 San Fernando earthquake near Sylmar, and the 1933 Long Beach earthquake. Nevertheless, all but a few quakes are of low intensity and are not felt. Parts of the city are also vulnerable to Pacific Ocean tsunamis; harbor areas were damaged by waves from the Valdivia earthquake in 1960. The city is situated in a Mediterranean climate or Dry-Summer Subtropical zone (Köppen climate classification Csb on the coast, Csa inland), USDA Zones 8-11, experiencing mild, somewhat wet winters and warm to hot summers. The prevalent warm southerly airflow and the blocking effect of mountains to the north give the city a much warmer climate than would be expected. The average annual temperature is 18.86 °C (around 66 °F), much higher than comparable coastal locations at the same distance from the equator elsewhere such as Sydney or Cape Town. Breezes from the Pacific Ocean tend to keep the beach communities of the Los Angeles area cooler in summer and warmer in winter than those further inland; summer temperatures can sometimes be as much as 18 °F (10 °C) warmer in the inland communities compared to that of the coastal communities. A few coastal "micro-climates" have never recorded a temperature below freezing. Coastal areas also see a phenomenon known as the "marine layer," a dense cloud cover caused by the proximity of the ocean that helps keep the temperatures cooler throughout the year. When the marine layer becomes more common and pervades farther inland during the months of May and June, it is called May Gray or June Gloom. Temperatures in the summer can exceed 90 °F (32 °C), but average summer daytime highs in downtown are 82 °F (27 °C), with overnight lows of 63 °F (17 °C). Winter daytime high temperatures reach around 65 °F (18 °C), on average, with overnight lows of 48 °F (10 °C) and during this season rain is common. The warmest month is August, followed by July and then September. This somewhat large case of seasonal lag is caused by the influence of the ocean and its latitude of 34° north. The median temperature in January is 57 °F (13 °C) and 73 °F (22 °C) in August. The highest temperature recorded within city borders was 119.0 °F (48.33 °C) in Woodland Hills on July 22, 2006; the lowest temperature recorded was 18.0 °F (−7.8 °C) in 1989, in Canoga Park. 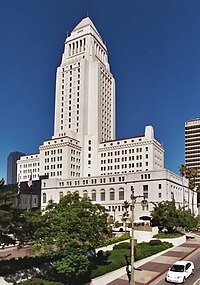 The highest temperature recorded for Downtown Los Angeles was 112.0 °F (44.4 °C) on June 26 1990, and the lowest temperature recorded was 28.0 °F (−2.0 °C) on January 4 1949. Rain occurs mainly in the winter and spring months (February being the wettest month), with great annual variations in storm severity. Los Angeles averages 15 inches (385 mm) of precipitation per year. Tornado warnings are also issued, which are extraordinarily rare downtown, though waterspouts are seen during severe storms at beaches. Snow is extraordinarily rare in the city basin, but the mountainous slopes within city limits typically receive snow every year. The greatest snowfall recorded in downtown Los Angeles was 2.0 inches (5 cm) on January 15, 1932. The Los Angeles area is rich in native plant species due in part to a diversity in habitats, including beaches, wetlands, and mountains. The most prevalent botanical environment is coastal sage scrub, which covers the hillsides in combustible chaparral. Native plants include: California poppy, matilija poppy, toyon, Coast Live Oak, and giant wild rye grass. Many of these native species, such as the Los Angeles sunflower, have become so rare as to be considered endangered. Though they are not native to the area, the official tree of Los Angeles is the tropical Coral Tree and the official flower of Los Angeles is the Bird of Paradise, Strelitzia reginae. smog from Mulholland Drive. Smog on Pasadena Freeway, downtown Los Angeles. Owing to geography, heavy reliance on automobiles, and the Los Angeles/Long Beach port complex, Los Angeles suffers from air pollution in the form of smog. The Los Angeles Basin and the San Fernando Valley are susceptible to atmospheric inversion, which holds in the exhausts from road vehicles, airplanes, locomotives, shipping, manufacturing, and other sources. Unlike other large cities that rely on rain to clear smog, Los Angeles gets only 15 inches (381 mm) of rain each year. Pollution accumulates over multiple consecutive days. Issues of air quality in Los Angeles and other major cities led to the passage of early national environmental legislation, including the Clean Air Act. More recently, the state of California has led the nation in working to limit pollution by mandating low emissions vehicles. As a result, pollution levels have dropped in recent decades. The number of Stage 1 smog alerts has declined from over 100 per year in the 1970s to almost zero in the new millennium. Despite improvement, the 2006 annual report of the American Lung Association ranks the city as the most polluted in the country with short-term particle pollution and year-round particle pollution. In addition, the groundwater is increasingly threatened by MTBE from gas stations and perchlorate from rocket fuel. With pollution still a significant problem, the city continues to take aggressive steps to improve air and water conditions. ↑ विलार्ड, सी. डी., द हेराल्ड्स हिस्ट्री ऑफ लॉस एंजेल्स (लॉस एंजेल्स: किंग्सले-बर्न्स, १९०१): २२. ↑ Pool, Bob. "In Woodland Hills, It's Just Too Darn Hot." Los Angeles Times July 26, 2006, B1. ↑ People at Risk In 25 U.S. Cities Most Polluted by Short-Term Particle Pollution. American Lung Association. Retrieved on January 5, 2007. ↑ People at Risk In 25 U.S. Cities Most Polluted by Year-Round Particle Pollution. American Lung Association. Retrieved on January 5, 2007. ↑ Lopez, Theresa Adams. "Air Quality Programs at the Port of Los Angeles saw Refinement in 2005 with Focus on Ramping up in 2006पीडीऍफ." Port of Los Angeles (News Release). February 17, 2006. ↑ Staff Writer. "Air Quality Protections Take Off." Environmental Defense. December 6, 2004.